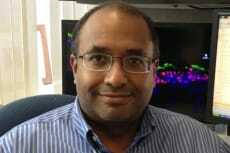 NYSCF – Robertson Stem Cell Investigator Dr. Jayaraj Rajagopal, Massachusetts General Hospital, published his latest research on stem cell response in injury repair in Cell Stem Cell. The paper describes how airway injury induces functional segregation of adult basal cells. Further, the research showed that effective regeneration involves intracellular communication between basal cells and progenitor cells. This research has broad implications for understanding injury regeneration at a cellular level as well as on why similar stem cells behave differently and work together under the same influence.